Tecta America Magco of Jessup, Maryland was awarded second place for its impressive install and roof membrane recycling effort on the Capital One Arena in Washington, D.C.
Reduce, reuse, and recycle. Those three R’s all help to cut down on the amount of waste we throw away. Unfortunately when it comes to a fourth R – roofing – the idea of limiting waste typically gets bounced. Not with the recent Capital One Arena project, however. 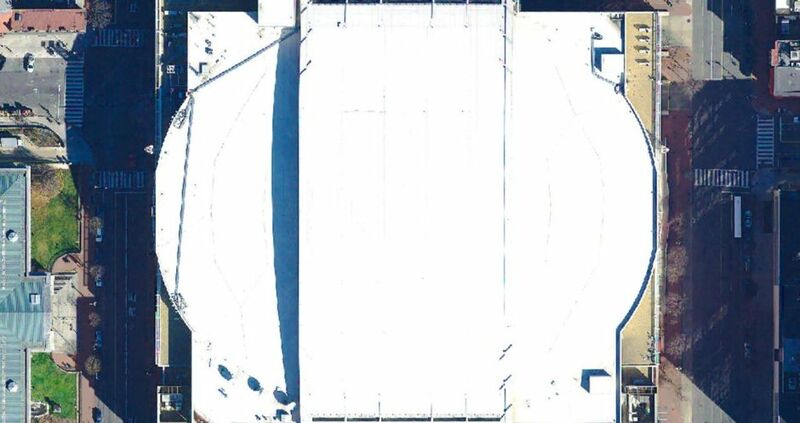 When it came time to replace the arena’s Sarnafil roof, Tecta America Magco made the decision to not only use a new rhinoBOnd Roof System using Sarnafil S 327 membrane but to also recycle the old membrane. Additionally, most of the existing insulation was inspected and left in place – new poly-iso insulation was placed over the old insulation in order to provide a high R-value. The biggest obstacles on this large 177,535 Square food project revolved around logistics, from getting the old roofing material packaged and sent back for recycling to limited crane access. In order to package the existing material, it needed to be sliced into predetermined widths that would fit into Gaylord boxes. These challenges were met with professionalism by the Tecta crew, resulting in a successful install and a sustainable new roof.